Dymchurch has a brand new sign depicting the historic heritage of the seaside town. Its official unveiling took place this morning (Sunday) when Parish Council Chairman Roger Wilkins thanked locals and everyone for attending on what was a cold, wet and blustery day as he introduced Sam Briggs, decorative blacksmith and resident of Dymchurch. 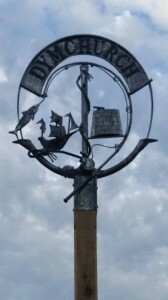 Who designed and made the amazing sign which depicts the essence of Dymchurch with a Martello Tower, fishing, ship and anchor and is the work of a true craftsman. Sam who is known for his creative work has recently had work broadcast on BBC, ITV and Channel 4.The Chairman also wishes to thank the Environment Agency for granting permission for the sign to be erected on its land. The event was witnessed by Colin and Margret Walker, from the Dymchurch and District Heritage Group, Carole Waters the KCC County Member for the District, David Owen on behalf of Shepway District Council.